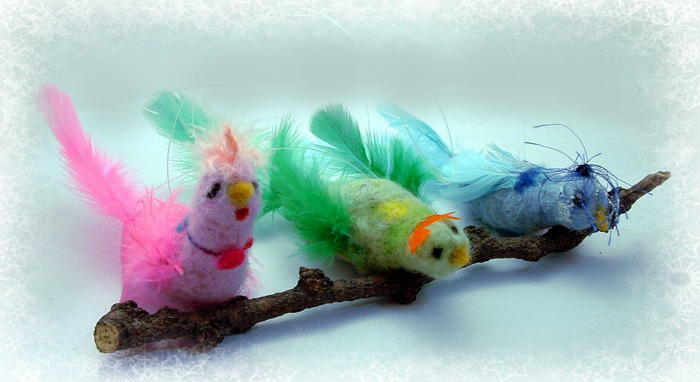 I decided to make felted flying Birdie holiday ornaments this year for Toni, Terri and Sarah. Why birds? I like birds. 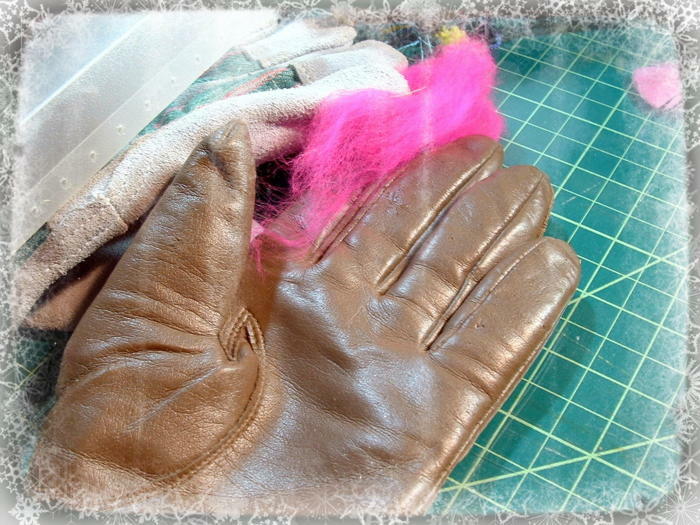 I like to needle felt with a leather glove on my left hand. I stab myself less often. 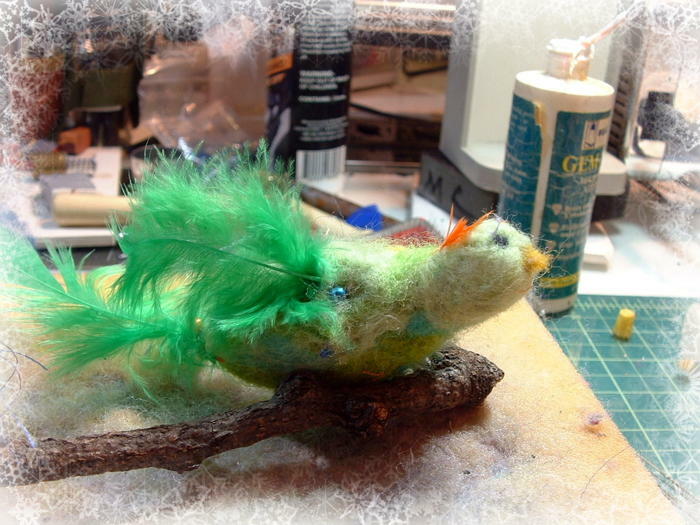 Ms. Green with her pins still in; I glued and felted in the feathers and embellishments. 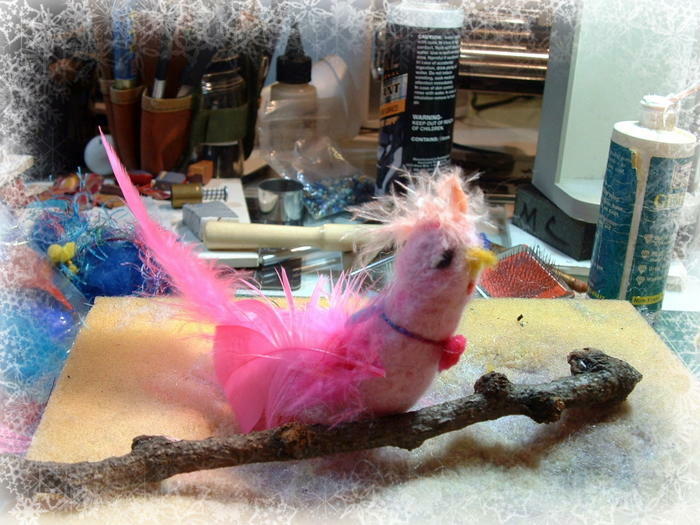 As I was making the Birdies, I realized that the glamorous Ms. Pink bore a slight resemblance to Toni. 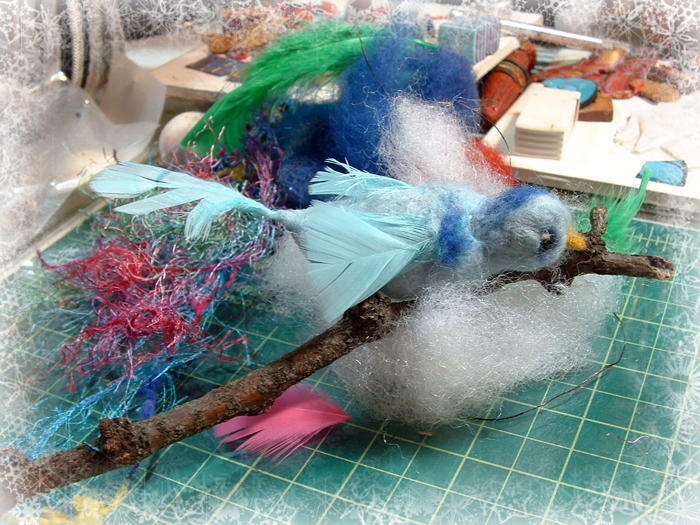 Bluebirds have a special meaning for Sarah who also loves glitter. (Ms. Bluebird took a dip in the glitter when I wasn’t looking and Ms. Pink made a hat for her.) Ms. Green wanted a skull charm necklace so she would look good with Terri. I did not have one, but she let Ms. Bluebird and Ms. Pink do her hair like Terri’s, complete with red bangs. Ms Green thought she looked Sqwaksome! 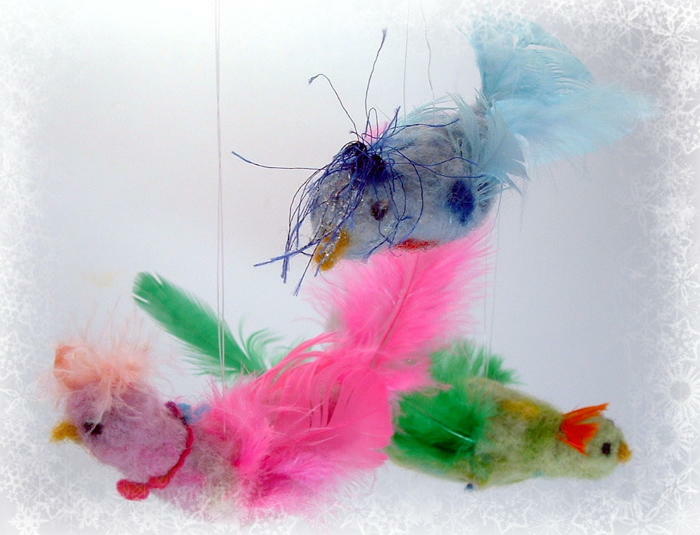 I left the Birdies resting on their communal perch. They are now in their new homes. 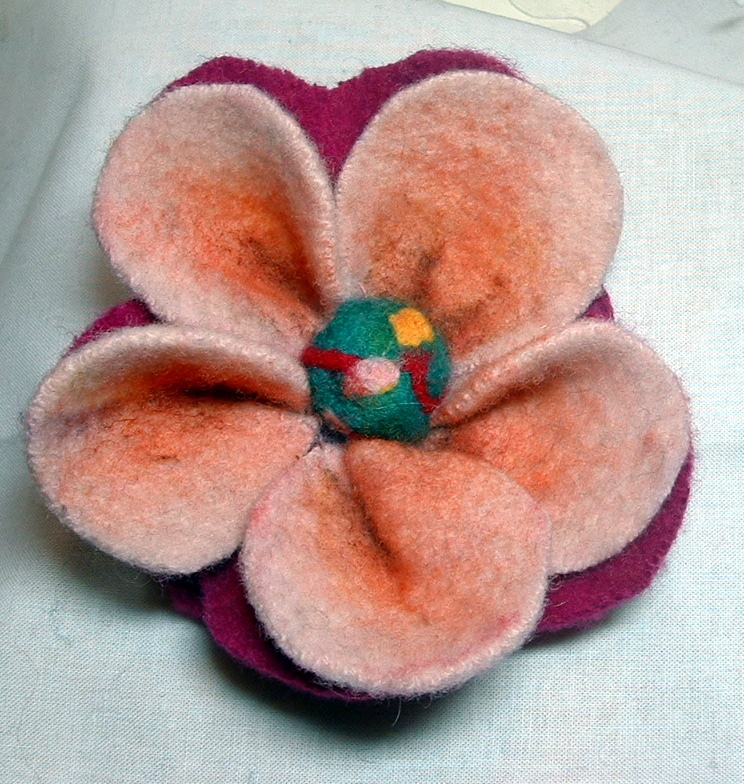 I went on a felted flower frenzy before the holidays and gave away most of the ones I made. There are lots of tutorials on the web. 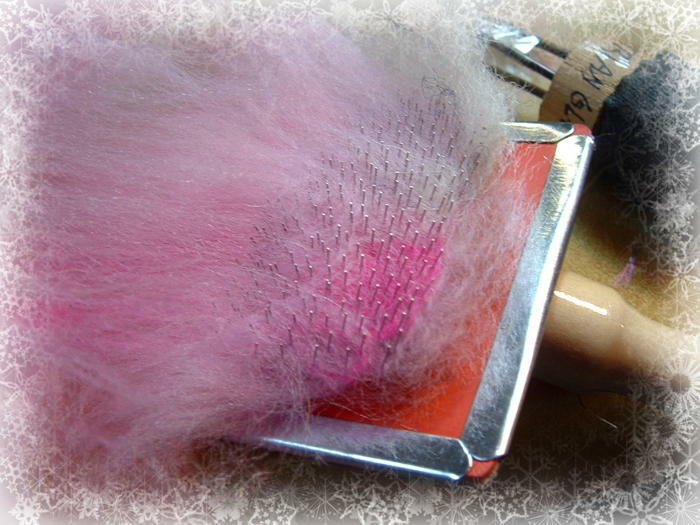 I liked this tutorial on Make It and Love It although I always add my own tweaks. Here’s another one from The diydish.com. I don’t like to use hot glue; I sew everything. 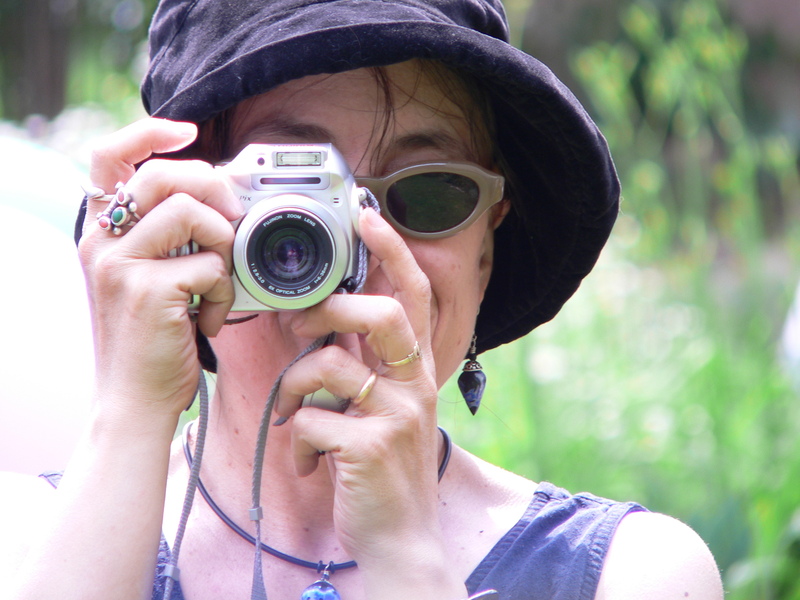 If you’re going to take the time to make something, why not make it to last? For most of the flowers, I started with sweaters I fulled into felt . 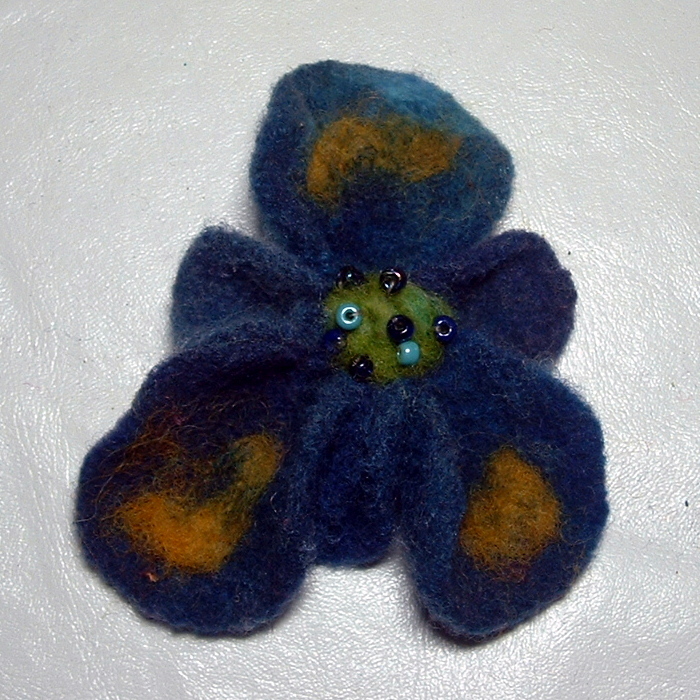 I used felt beads I’d already made for the center of the flowers. 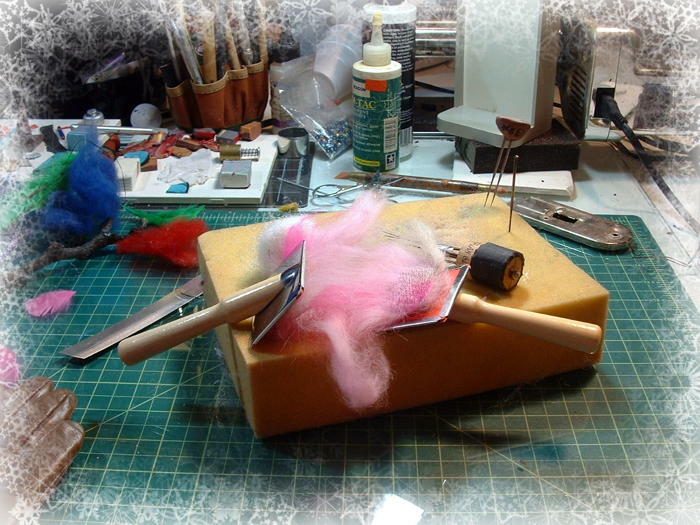 (Tip – you can cut a felt bead in half with a single edged razor blade and you have two flower centers!). I shaded the petals with some needle felting and with Sharpie Fabric Markers which don’t have to be heat set. I shaped some petals by “blocking” and sewing. I also did some beading embellishment. 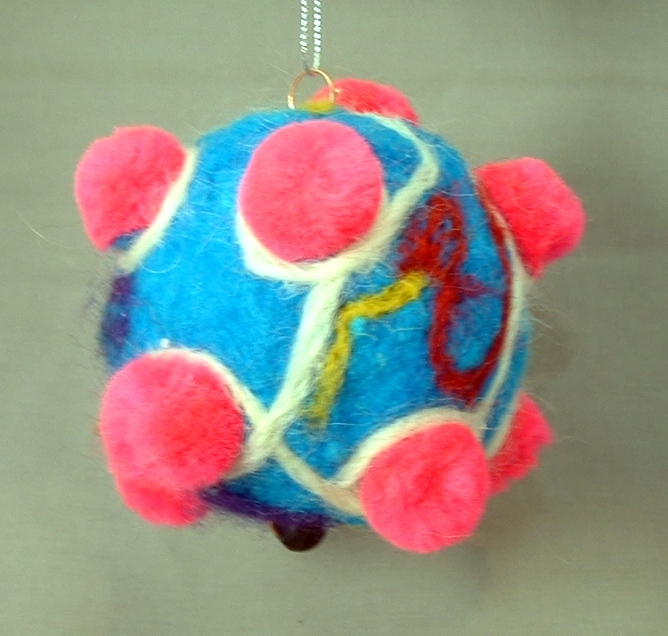 As for different techniques, there are tutorials on pom-pom flowers, box folded flowers, felted roses and layered felt flowers. And don’t forget YouTube. You don’t have to limit yourself to felt either. Tipnut has links to tutorials for 30 different fabric flowers. It’s the time of the year for Santa’s workshop to be in full swing. 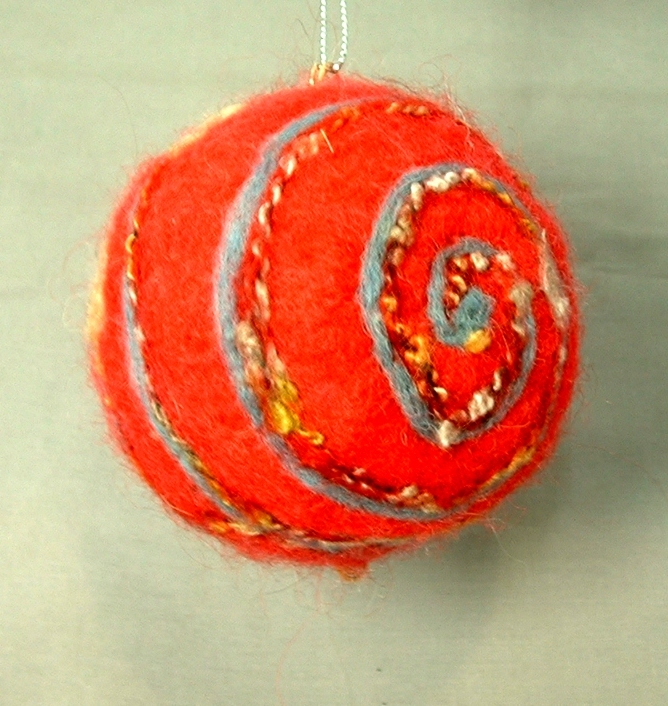 I am making ornaments again, and this year I am incorporating felting with the polymer clay. 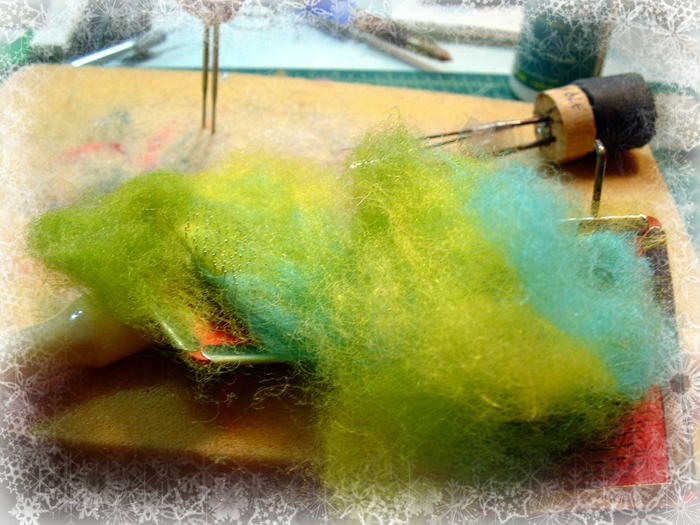 I could use some elves to do the needle work for me, but I find needle felting very relaxing (when I don’t stab myself with the needles-thankfully not too often) and mixing the different yarns and color of roving reminds me of painting. 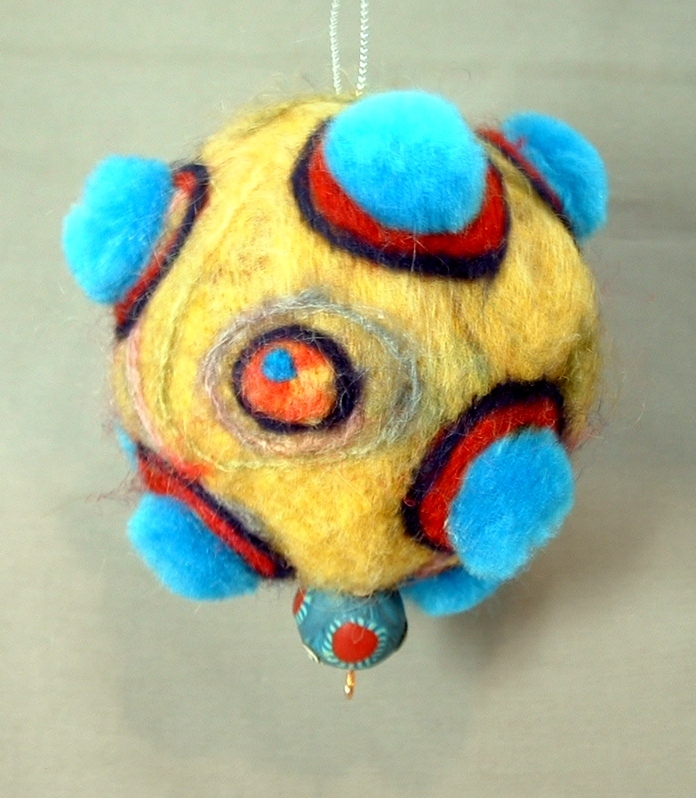 The ornaments here are mostly needle felted over styrofoam balls. 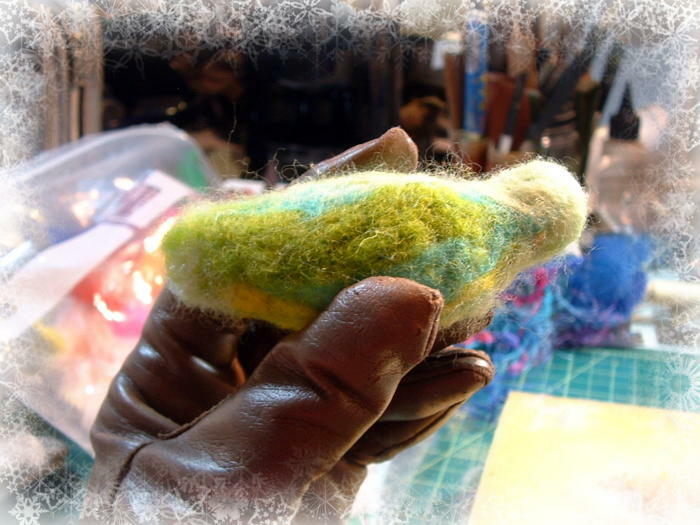 I wet felted one base and decided that needle felting worked better for me. 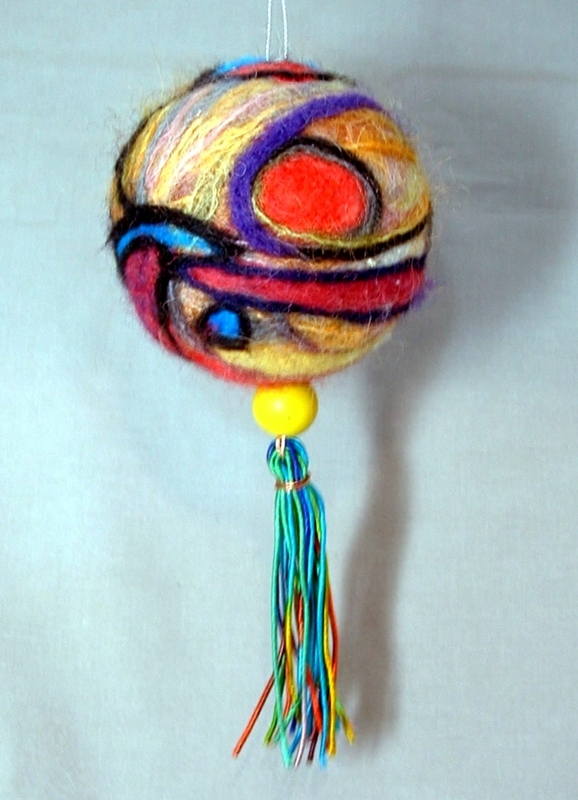 The embellishments are pom poms, additional yarn and roving, and polymer clay canes and beads. 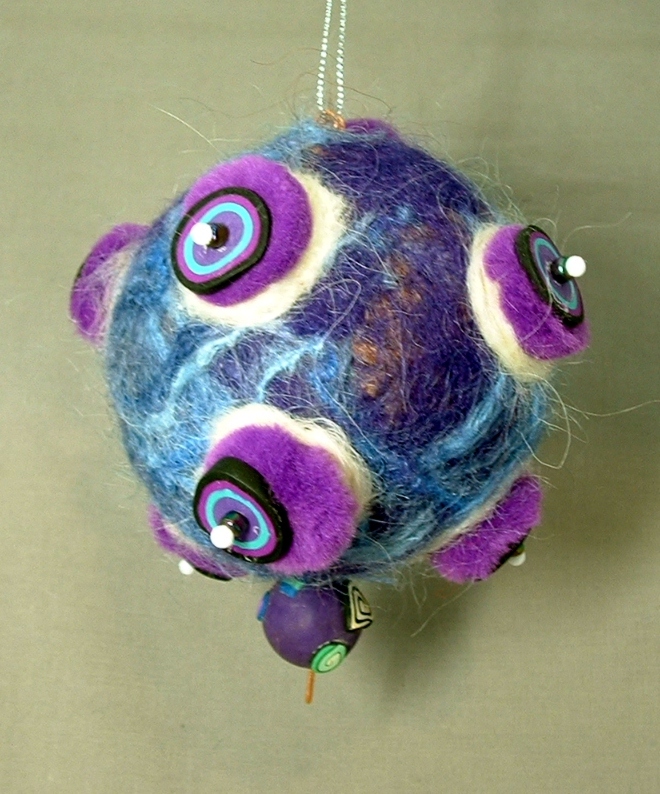 The Internet is full of sites offering free felting directions. 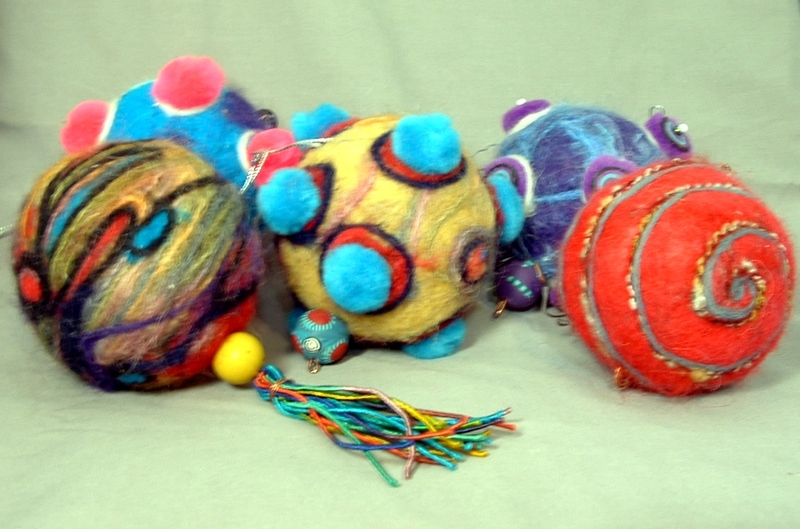 Feltmakers List FAQ is a good place to start. YouTube has lots of videos and some are quite good. 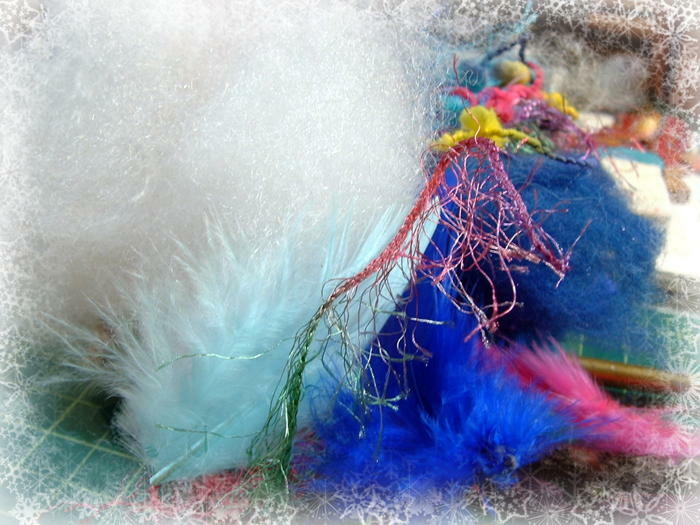 And since crafters have diverse ways of doing the same thing, it’s always helpful to read a few sets of instruction and watch a few different videos.